What do ya wanna know about her? La Madama is not a spirit i have encountered in hoodoo under that name; as Papa Rouj said, this name refers to spirits from Espiritismo, and is quite popular among Cubans. While we do carry a lot of non-hoodoo items at the shop, our focus is on African American conjure, and most of our customers request and buy items from that tradition. We attempt to teach what we practice, and to preserve and popularize the conjure traditions of the USA. I have only very recently--like in the last 3-4 months started hearing people ask and talk about La Madama. I don't know where its coming from exactly although I can guess as to a few sources. She is definitely not a spirit that I have encountered in Hoodoo and my oldest clients--the ones that are most tapped in to the really old traditions of Conjure have not heard of her. There is an influx of Latin American and Afro-Cuban spirits into areas along the Tex-Mex border and in Florida. In such areas conjure doctors are beginning to work with spirits introduced to them by workers from other traditions or from their clientele. Hence there has been an increase of interest in San Simon/Maximon, La Madama, Santisima Muerte and others. These are relatively new introductions into hoodoo and certainly not traditional, nor wide-spread. However it stems from these regions and it definitely is on the rise. A pack of playing cards could be something that you can purchase from LM to help you connect with La Madama, as she is often a guide an dprotector and fortune tellers who work with this specific medium. Ms_Nadezda_Karuna wrote: A pack of playing cards could be something that you can purchase from LM to help you connect with La Madama, as she is often a guide an dprotector and fortune tellers who work with this specific medium. This is great advice I use the gypsy witch cards, and so far so good especially with lottery numbers! I was just wondering, if La Madama is connected to divination...is there a similar spirit that is a part of hoodoo that also has a connection to divination that might be called upon when doing readings? Thanks! I call on St. Michael (as he has Mercurial associations, and I often work with him for matters of spiritual communications), my Guardian Angel, and my Ancestors before every divination - and I ask to be blessed by the Father, the Son, and the Holy Spirit with the gift of sight, the gift of knowing, and the gift of interpretation. There's no specific spirit to call on. It would be a personal choice. SweetLady wrote: I was just wondering, if La Madama is connected to divination...is there a similar spirit that is a part of hoodoo that also has a connection to divination that might be called upon when doing readings? Thanks! In conjure we work with Spirits of the Dead, whether we contact them in the graveyard, through magical workings, or they could be our ancestors and Spirit Guides. La Madama is a name for a type of Spirit Guide that is said to be especially beneficial for diviners, and can also represent one's ancestors. In this sense you can work with your own Spirit Guides, especially those that tend to help you in readings and fortunetelling. You can work with a doll or a statue consecrated for that spirit. If the Spirit is an ancestor, and you have access to their graveyard dirt, you can load the doll with it + herbs that are used in hoodoo for clairvoyance and psychic powers. Talk to it, leave it appropriate offerings, and pray over it. Another idea is to try spiritually connecting with a known two-headed doctor, and if you're lucky (and gifted for such work) you'll be helped and guided. I have a question about fixing La Madama statues and dolls. How do you do it? I would like to fix a statue of mine and don't know how. Thanks in advance for all responses. La Madama is a type of statue representing a middle-aged, heavy-set woman of African descent, dressed in 19th century house-clothes as a domestic worker, cook, or servant. In America they are often called "Aunt Chloe" figures, after the wife of the title character in the 1852 anti-slavery novel "Uncle Tom's Cabin" by Harriet Beecher Stowe. Pairs of ceramic Uncle Tom and Aunt Chloe figures used to be made for mantelpiece decor. Aunt Chloe was a cook, and she is usually depicted with a food basket. 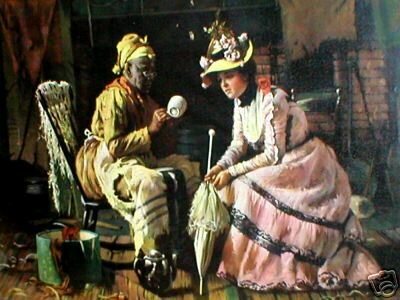 Uncle Tom and Aunt Chloe figures were popular in other nations as well as the United States, due to the world-wide popularity of the book "Uncle Tom's Cabin," which was said at the time to be the most important convincer to people that slavery was wrong. 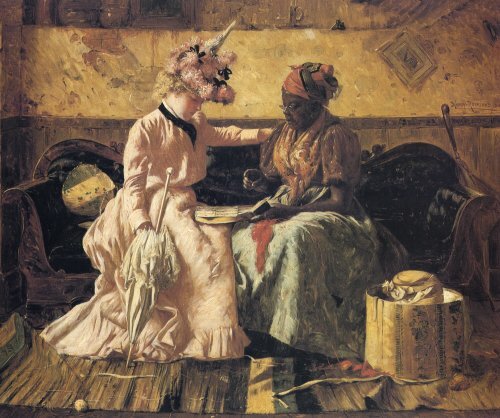 Even after slavery officially ended in America in 1863, the book remained a consistent seller and gave rise to numerous stage-play productions.As late as the 1930s, these plays were still being "quoted" in movies that had nothing to do with slavery or its history, but were, instead, fictions about theatrical life. Even Shirley Temple did a turn as Little Eva in a play-within-the-play segment of the 1936 movie "Dimples." Eventually, as fewer households employed butlers, The Butler (sometimes called Uncle Mose) was replaced with a new figure, The Chef. The Chef, like Aunt Chloe and Mammy figures, is a cook. Mammy and Chef figures usually have both hands on their hips. Sometimes they hold a spoon in one hand as well. The Chef and Mammy became such well known icons that they lent themselves to commercial imagery as the logo-characters for brands of food. The Chef became "Rastus, The Cream of Wheat Man" and "Mammy" became "Aunt Jemima," purveyor of Pancake mix. I was just reading this morning about La Madama in Starr Casas' "The Conjure Workbook." Thank you for the historical background! I am not sure if this is the right forum to post this. But, I had a very strange and real dream with madama. I believe she was my inner madama. In my dream she gave me a bone reading and told me that I was confused and at a crossroads in my life right now, which is true. She told me she was not sure certain things would pan out for me. Then she started uncrossing me. I think she was trying to let me know that I've been crossed and it will hinder my future if I do not do something about it. Has anyone else experienced this or something similar? Do you think it means I am crossed -- or just an overactive imagination? I have no idea if she came to you or if it was your imagination. However, if I had a dream like this, I would start doing some uncrossing rituals on myself. I would rather be safe than sorry. I would do a 13 day uncrossing bath, I would anoint myself with uncrossing oil, and I would perform an uncrossing candle ritual. If you watch the film the craft you will see a MASSIVE la madama on the woman's table (the women who has a shop) I was surprised this made me realize shes been around for a long time.